adding such a feature. I think it should be removed. You can read the whole discussion in the thread I linked to, above. 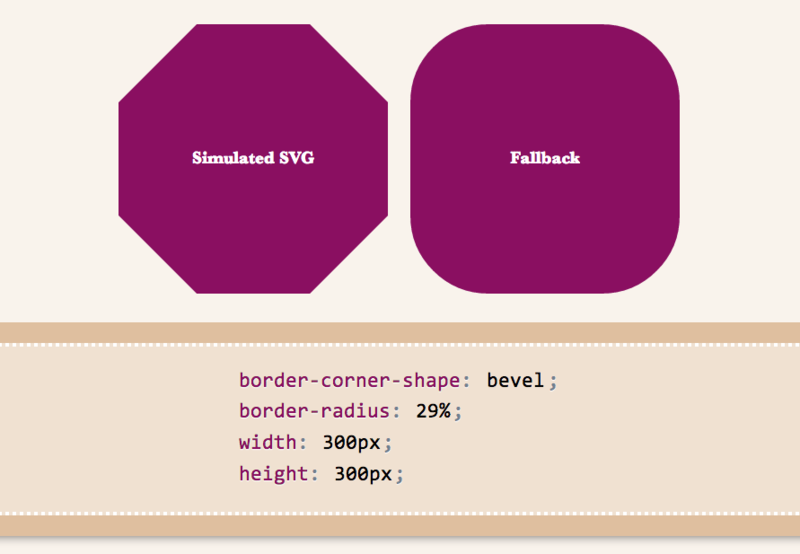 I might be wrong, but I believe border-corner-shape would greatly simplify many common effects, especially its “bevel” value, which can even create triangles and other polygons, that we go to great lengths to make with CSS today, and it would degrade much more nicely than border-image or backgrounds. I think it was one of fantasai’s many great ideas and I’m glad she added it to the Editor’s Draft of Backgrounds & Borders 4. 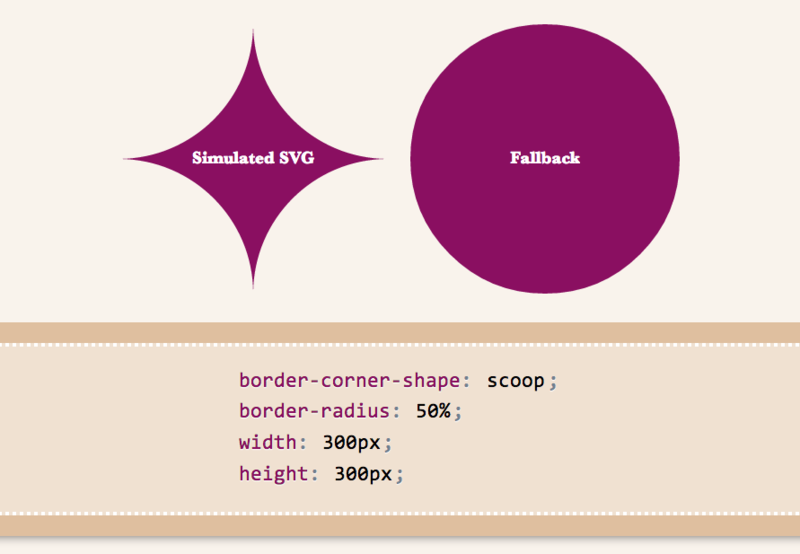 I posted a list of tutorials and questions from web designers & developers, to illustrate that these effects are needed. 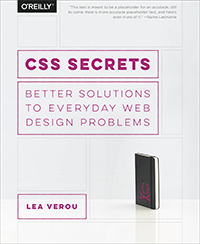 However, David argued that “Questions from authors don’t give you enough information to be sure that the feature being added is sufficient for the author’s needs”. He did have a point, so with some help from the community, I posted a few links to websites using such effects, and use cases. Nicole Sullivan, Liam Quin, fantasai and Lev Solntsev posted a couple more. 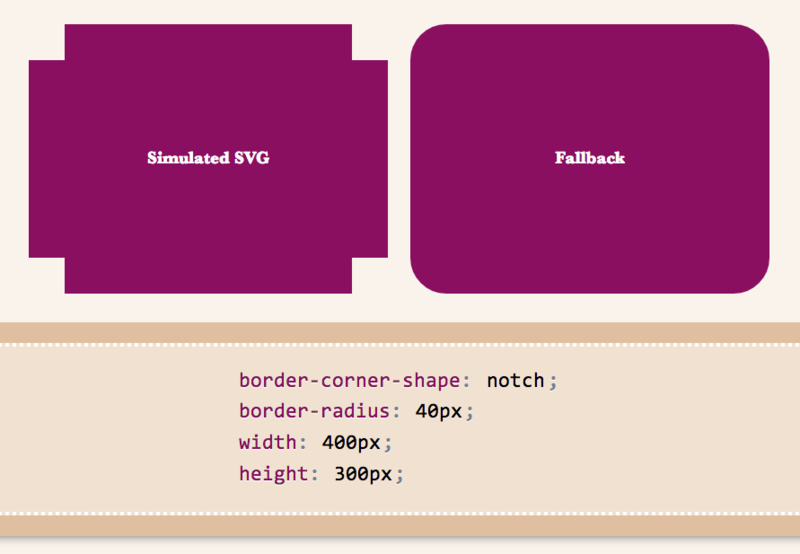 However, the more real examples we have, the more likely it is to retain the feature in some form. This is where you come in: If you think border-corner-shape has merit, provide use cases, either by links to websites whose design elements it would simplify, screenshots of websites or descriptions of cases where you needed such a thing (in that order of preference). You can either post to the thread directly, or comment here and I’ll post them to the list in batches. If you think it has merit but it could be improved, feel free to post about that as well. If you don’t think it’s a good idea, any alternatives you can think of are welcome as well. Or, if you don’t think it’s useful, say that too (but make sure you first fully understand what it can do). If you’re not sure how it can be used, play around with the demo app I made and be creative! 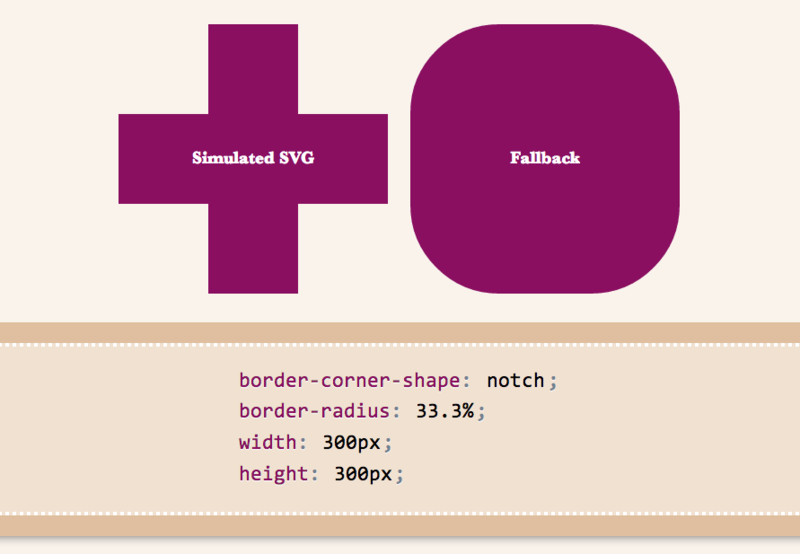 I wanted to demo triangles and trapezoids as well, but it seems there’s a bug in my app, so I’ll have to debug it first 🙁 If we allow border-corner-shape to have different values for all four corners, even more possibilites open (e.g. arrows). 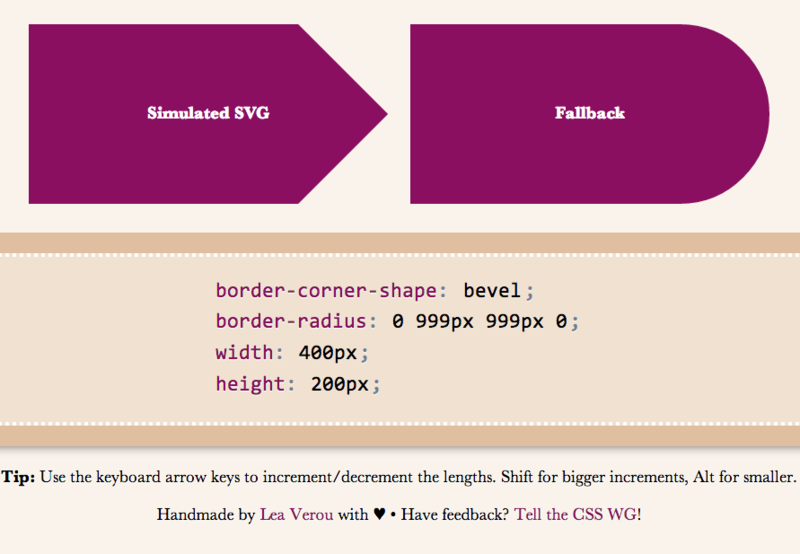 Spend a few minutes to help the CSS WG help you. Thanks! 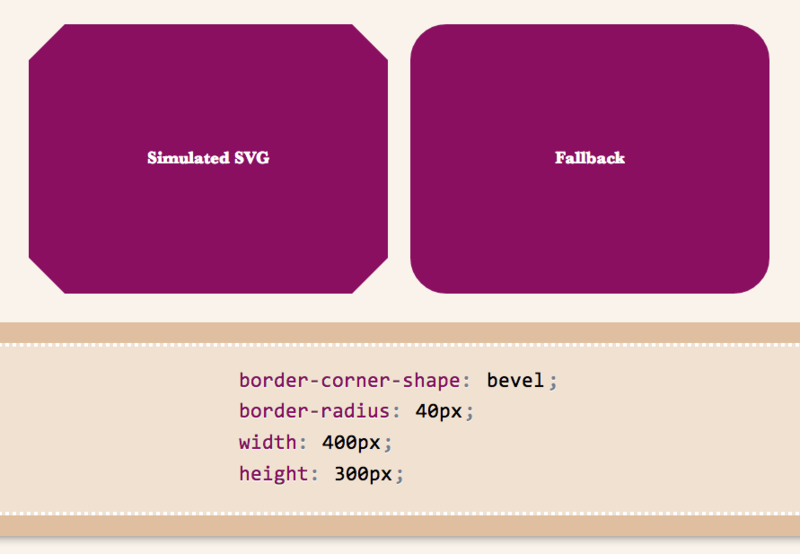 This entry was posted in News and tagged border-corner-shape, CSS4. Bookmark the permalink. 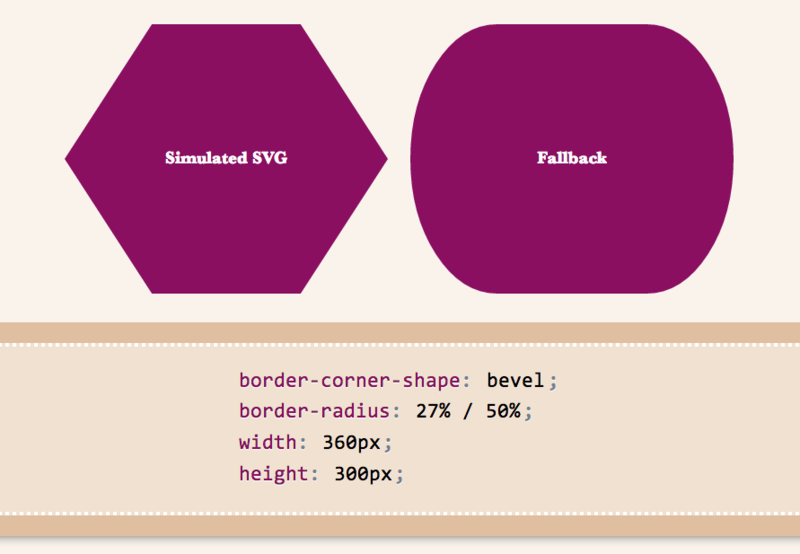 ← Preview corner-shape, before implementations!